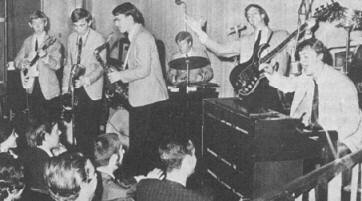 Zoot and the Big Roll band are still going strong today. 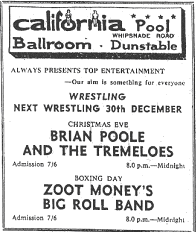 They played the California on a number of occasions during the early to mid sixties. "Everybody remembers the California Ballroom! (I think a bouncer threw me across the stage when I attempted to climb up the curtain at the back to get a drink at the balcony bar up behind the stage once!!" So now we know why they moved the stage from underneath the Vista Bar. It wasn't because the customers kept throwing their drinks on the bands, it was because Zoot Money kept climbing up the curtains! Nice one Zoot and thanks for the quote.